I was prepared to stand in a queue to get into the louvre abu dhabi in the United Arab Emirates (UAE), as I had done when I visited Musee du Louvre in Paris, France, three years ago. I had psyched myself up for the Louvre Abu Dhabi visit as the outdoor temperature slowly rises to 35 degrees. Yes, it is a hot day to be out and about in the UAE although the Emiratis tell me that I am visiting their country at the right time of the year. They have had temperatures as high as 50 degrees during the summer. The Louvre Abu Dhabi is located on Saadiyat Island, some 500 metres off the coast of Abu Dhabi (which, if you don’t know yet, is also an island in the UAE). The roof dome is a geometric structure of 7,850 stars, repeated in various sizes and angles and in eight layers. Saadiyat Island is Abu Dhabi’s cultural district devoted to culture and thearts. The district is being developed by the Abu Dhabi Tourism Authority-held Tourism Development & Investment Company (TDIC). The drop-off area is a mere five to 10-minute walk to the main entrance of the building but I can already feel sweat trickling down my back as I walk under the hot sun. The first thing that struck me is that there is no queue to enter the building unlike in Paris, where it can take you up to five hours to get into the Louvre there. ‘There must be one inside,’ I tell myself. Surprisingly, there is none. The cool blast from the air conditioner is a welcome respite as I open the door for access into the building. The walls inside the buildings are painted white, as pristine as the Kandura (ankle length white shirt woven from wool or cotton) worn by the male Emirati staff manning the information and ticketing counters. The ladies are in their black abayas. The security officials are in their black suits. You can either purchase the tickets online or you can get it at the ticket machine or the ticketing counter. Backpacks are not allowed in, so you will have to check it at the bag counter. Handbags will be checked by the security officials and you’ll be told that you’re not allowed to use selfie sticks while in the museum. From afar, the roof dome of the Louvre Abu Dhabi looks as if it is floating above water. But it is not. In fact the dome - weighing as heavy as France iconic structure, the Eiffel Tower, at 7,500 tonnes - rests on four permanent piers, each 110m apart and hidden within the museum. The roof dome is definitely the centrepiece of the museum. Inspired by the cupola, a distinctive feature in Arabic architecture, the design is a geometric structure of 7,850 stars, repeated in various sizes and angles and in eight layers. When the sun shines through it, the effect is simply magnificent. It creates a rain of light, reminiscent of sunlight filtering through palm fronds, into the dome. It is little wonder that many visitors to the Louvre Abu Dhabi spend more time exploring outside the museum. Designed by French architect Jean Nouvel and constructed by engineering firm Buro Happold, the Louvre Abu Dhabi is 24,000 square metres in size and 8,000sq m of gallery space, making it the largest art museum in the Arabian Peninsula. The little holes in the roof of Louvre Abu Dhabi creates a rain of light into the dome. There are 55 stand-alone ‘buildings’ that visitors can meander in and out. Waterways run through the museum, mimicking Abu Dhabi’s historic falaj irrigation system. It was in 2007 that the Abu Dhabi and French governments signed an agreement that envisioned 30 years of art loans, management advice andspecial exhibitions, as also rights for Abu Dhabi to use the most famous museum name in the world: the Louvre. Under the agreement, France will rotate between 200 and 300 artworks, provide management expertise and hold four temporary exhibitions a year. 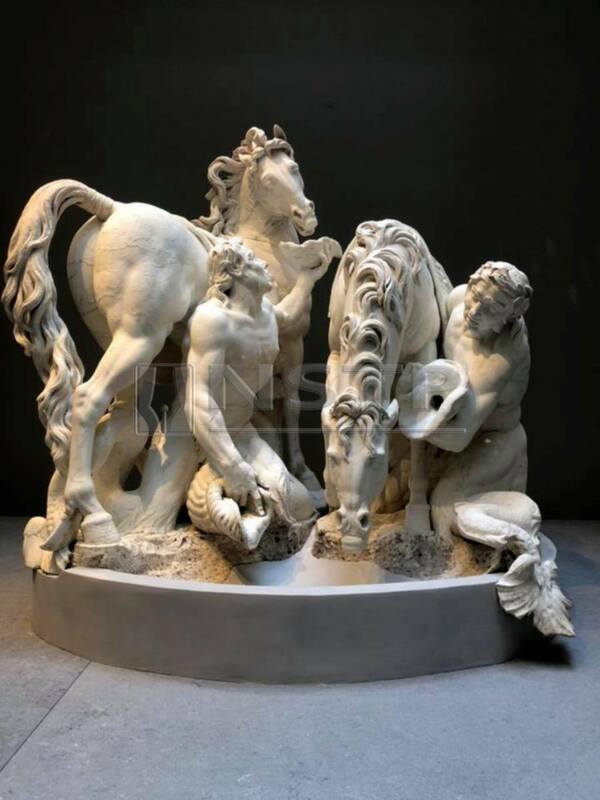 The art pieces will come from 13 different French museums namely Musee d’Orsay et de l’Orangerie, Musee du quai Branly, Centre Pompidou, Musee national des arts asiatiques Guimet, Chateau de Fontainebleau, Musee de Cluny — Musee national du Moyen-age, Musee d’archeologie nationale Saint Germain en Laye, Bibliotheque nationale de France, MuseeRodin,ChateaudeVersailles,Musee des Arts decoratifs de Paris and Sevres — Cite de la Ceramique, as well as other French institutions, and Musee du Louvre, renowned for its museological excellence since its foundation in 1793. The total gallery space is only about one tenth of the Louvre in Paris but it is said to carry the most tightly curated collection of high quality artworks in the world. 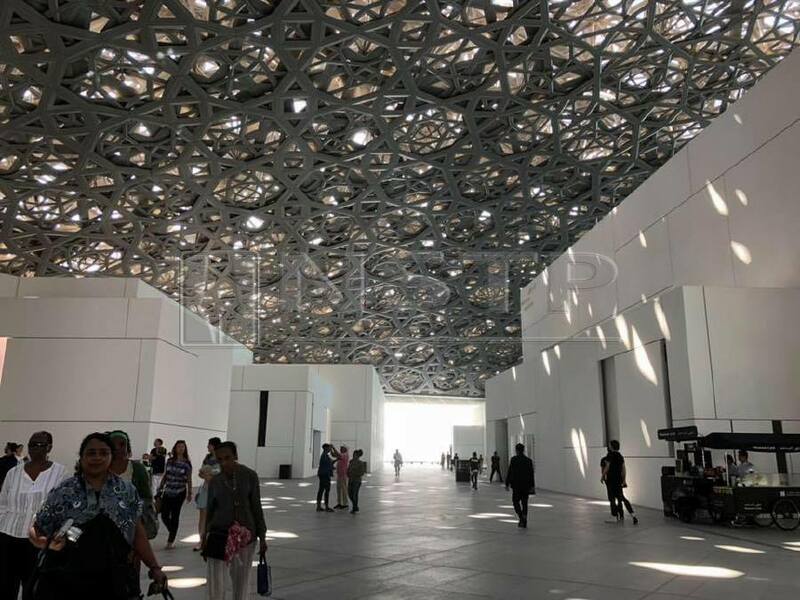 There are 12 galleries in the Louvre Abu Dhabi, each exhibiting priceless collection of objects and works of art spanning time, place, cultures and civilisations. The galleries are: The First Villages, The First Great Powers, Civilisation and Empires, Universal Religions, Asian Trade Routes, From the Mediterranean to the Atlantic, The World in Perspective, The Magnificence of the Court, A New Art of Living, A Modern World?, Challenging Modernity and A Global Stage. The galleries tell the story of humanity, each focusing on shared themes and ideas that reveal common connections throughout humanity. The items on display ranged from prehistoric artefacts to contemporary artworks. A visitor can cover the entire museum in under a few hours but if you are an art enthusiast you would probably linger on a little bit longer, especially as the Louvre Abu Dhabi houses some special art masterpieces and exhibits. At the Universal Religion gallery, I find that the Torah, Bible, Quran and Sutra scrolls being showcased side by side. There are also Christian stained-glass windows and Islamic lanterns on display, which revealed some similarity in the different religions in showing the symbol of faith. It is amazing to note that most of the Islamic relics on display are owned by Musee Du Louvre and on loan to Louvre Abu Dhabi. One eye-catching exhibitis a huge limestone installation by American conceptual artist Jenny Holzer titled ‘For Louvre Abu Dhabi’. She had created three monumental text pieces in stone; with Arabic script from a manuscript of the Muqaddimah by Ibn Khaldun, a 14th century treatise on the writing of history. And, if the Musee du Louvre’s main attraction is Leonardo da Vinci’s painting called the Mona Lisa, the Abu Dhabi museum’s attraction currently is also a portrait of a woman. La Belle Ferronniere, also known as the portrait of the Unknown Woman, is da Vinci’s oil on wood painting of a serious looking young woman dressed in red velvet. The painting is on a one-year loan from Musee du Louvre and one of five paintings by da Vinci that is owned by the Paris museum. It is also the first time that La Belle Ferronniere had left Europe to be displayed else where and the first time a painting by da Vinci is exhibited in the Middle East. In many museums, you would not be able to get as up close to a da Vinci as you would at the Louvre Abu Dhabi. Unlike the Mona Lisa, which is displayed behind a bullet-proof glass casing, the La Belle Ferronniere only has a stanchion barrier distancing art lovers from touching the painting. One of Louvre Abu Dhabi’s galleries is on Universal Religions. A Christian stained glass window is one of its exhibits. Well, yes, there is also a security official standing guard next to it, just in case someone gets too near to the art piece. It is great for selfies as there is no reflection from any glass panel. Surprisingly enough, most of the art pieces and sculptures are cordoned just by the stanchion barriers. Last year before the opening of the Louvre Abu Dhabi, the Abu Dhabi Department of Culture & Tourism bought da Vinci’s painting of Christ as Salvator Mundi (Latin for ‘Savior of the World’) dated to circa 1500 for US$450.3 million (about RM1.9 billion), setting a new record for the most expensive painting ever sold. It has yet to be put on display at the museum. Salvator Mundi is one of fewer than 20 known surviving paintings by the Italian Renaissance master. It would be worth another visit to the Louvre Abu Dhabi when this piece is put up on display or to time the next visit when it holds the temporary exhibition. PAY 60AED (about RM68) for 22 years old and above; 30AED (ages between 13 years and 22 years), free admission for children under 13 years old and for the disabled accompanied by one companion. HOURS 10am to 8pm on Saturdays, Sundays, Tuesdays and Wednesdays. 10am to 10pm on Thursdays and Fridays. The museum is closed on Mondays. Last entry and purchase 30 minutes prior to close. FACILITIES Wear comfortable shoes as the museum is a vast area to cover. There are plenty of sofas for you to sit to rest your weary feet. A free audio tour is offered in Arabic, English, Hindi, Japanese, French, German, Korean, Russian and Chinese. Water bottles are allowed but not food. Photography and mobile phones are permitted in the Louvre. HOW TO GET THERE Etihad Airways operates daily scheduled services from Abu Dhabi to Kuala Lumpur.